The one-on-one meeting is one of the most important tools you have as a manager. It’s the best way to discuss issues, develop relationships, and make sure an employee’s goals are being met. It sounds simple enough, but in order for them to be effective, there’s more to it than just sitting down and chatting. What are One-On-One Meetings And What Are Their Purpose? They are a time to ask strategic questions such as, “are we focused on the right things”? From our experience of using one-on-ones at Officevibe, they are a time to catch and stop problems in their track, realign on goals, build trust and ensure that employees are heard and feel valued. They are about taking a breather after a month-long bout of hard work and reflecting, together. They are a human-fueled activity that reminds companies to put employees at the center ❤️. Showing up to a meeting with last minute ideas is not efficient, and it will make your employees feel as though they’re an afterthought. A great place to start is to review the last one-on-one you had with them (if this is not your first) and make sure to do a follow-up. In our last one-on-one you mentioned you were frustrated by X and wanted to try Y as a solution. How has that been going? It’s the perfect time for you to give your employee some feedback. Recognition for their hard work is a great way for you to make your employee feel valued, and thus make them more productive. Take a moment and start recollecting general observations about their contribution to the team/workplace. Constructive feedback is just as good, just be careful about how you deliver it. One-on-ones are not meant to be exclusively for professional topics, so show some interest in them by asking some general questions about their lives, beliefs, and aspirations. Sometimes these meetings can be a little bit hard to navigate. The conversation can feel forced or lacking in depth. How can you fix it? A good place to start by mixing things up a bit. Try holding the meeting at the cool new coffee shop that opened down the street or just simply go for a walk. The important thing is to change things up. I’ve noticed that our last several one-on-ones have stayed pretty surfaced. What are your honest impressions of this meeting? What could we be doing differently or better? What would you like to see change in these discussions? How could we make them more useful for you? I’m trying to make my one-on-ones better and would appreciate your honest feedback on this one — what did you like about it, and what could be improved? This will definitely accelerate the process as it will help the employee collect their thoughts prior to the meeting while also helping you guide the session. What they need from you if they encountered any roadblocks. From a high-level, here is a suggestion for how you can structure your one-on-one, but keep in mind that you don’t need to confine yourself to this timeframe. It is more important for the conversation to flow naturally. Start your meeting with about 10 minutes of informal catch-up. The point of this part is to make your employee feel as comfortable as possible. It’s a nice, light way to start off the meeting, and shows employees that you genuinely care about them as people. You can follow up on something that was brought up in a previous one-on-one (Hint: bring a pen and paper and start taking notes!) or just ask how life is going outside of work. It is important to listen during this time more than you speak. Block about 20 minutes for this part, but if this goes longer, don’t cut the employee off. It’s during this block of time that you can encourage employees to share whatever is on their minds. Tip: Try pausing for 3-4 seconds before responding to what they just said. This might encourage them to dive deeper into what they were just saying. It’s important to come prepared with notes on where your employees deserve recognition and what you would like them to improve so that you don’t forget anything you wanted to say. Coming unprepared can be invalidating for employees, demonstrating that they weren’t worth the time. As a great leader, it is your innate desire to constantly grow and learn. Use this opportunity to have an open and honest discussion about how you could be a better leader for them. I’d like to improve as a manager and I could really use your help. Next week, would you be willing to share some feedback on one to two things you think I could do better as your manager? Need a template? 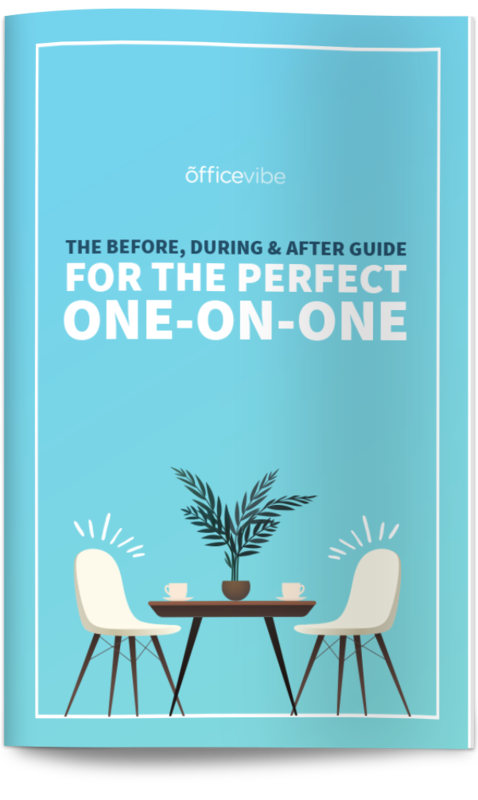 The complete Before, During & After Guide for the perfect one-on-one – printable template included. Take 10 minutes at the end of the meeting to come up with an action plan based on what was discussed so that you can follow up properly for the following month. Setting 1-3 clear goals will really help employees focus over the course of the next month. What do you need from me in order to achieve your goal? These types of meetings can be tough, especially for new managers if they conducting them for the first time. Here are a few tips to make sure you have an effective one-on-one everytime. One of the most important tips is that it’s the employee’s meeting, not yours. While this might seem subtle, it’s important to change your frame of mind to focus on the employee. While it’s important to actively listen to your employees while they speak, it is also essential to document the key points of the meeting so that you can follow up properly in the next one-on-one. To avoid physical blockers, which can create a sense of mistrust between you and your employee, use a pen and paper to jot down your notes instead of using a laptop. Pings and alerts are sure to pop up and distract you. In fact, avoid all devices in the meeting so you can focus respectfully. Giving negative feedback can be as stressful for managers to share as it is for employees to receive – we get it. Anticipating hurting someone’s feelings, having a defensive reaction, or being unliked afterward. These are valid fears. Most employees want the feedback so that they can improve, but there are certainly some dos and don’ts when it comes to communicating. Focus on behaviour, not personality: It’s harder and more discouraging to have to change who you are than an action that you do. Be specific: Zoom in on a certain problematic area instead of creating negativity around their general work. If they were disorganized, give the specific instance, don’t label them in general. Avoid negative terms: Ultimately, you want a positive outcome. Avoid words like “but” because it primes defensive behaviour and removes weight from the positive feedback before the “but”. Want to be a better communicator all around? 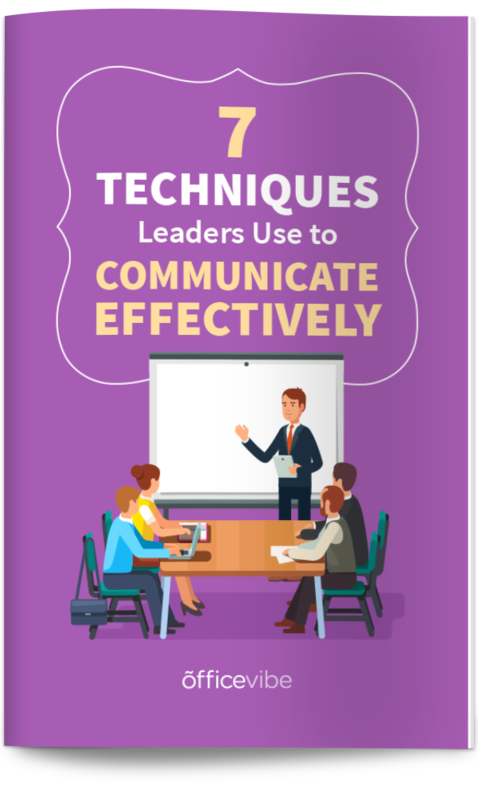 Download these 7 amazing communication techniques for leaders.